I can think by myself for hours. I suppose that is why I love silence and running in the mountains. They offer me the space and time to roll ideas over in my head; to commune with the Universe on a deep level. It wasn’t until a few years ago when a friend helped me identify my top five strengths that I started to see how much deep brain diving, called intellection, was a part of my life. Combined with a strong penchant for the future, I tend to think with a big picture frame of mind. I’ve done it since I was a little girl. I now understand why I can obsess over architectural details for weeks at a time and then get impatient with coffee table styling, or love stewing about the emotion I want a painting to express without knowing how the brushstrokes will make that happen. That is why this time of year is so special to me. Not only are people going out of their way to show love, I also get to spend time reflecting and goal setting. No matter what is going on, I can’t stop writing and thinking about all the possibilities that a new year will hold. Being able to shape the future excites me. But then, what about reflecting? I know I had a lot of ideas for 2016. Some panned out. Others didn’t. I seemed to be on track for the first six months and then it all seemed to go in another direction. In my usual, crazy way, I started wondering why. Was it something I did? Certainly. Was it chance? Missteps? The Divine showing me that I still need to take another path? What good are goals if life has something else planned anyway? Should we even try? When I ask myself that question, it makes me roll my eyes. Of course we try! But fate or chaos, (whichever you prefer) certainly likes to play its hand. How do we live with it? And what efforts are worth taking, if we don’t have all the say? That’s when a book completely changed the way I thought. The answer, it turned out, could be found by watching clouds. “A cloud in the sky is a complex system composed of basic elements, air and water molecules. A cloud is complex because it meets the three criteria of being open to influences from outside itself, chaos-capable, and non-linear. 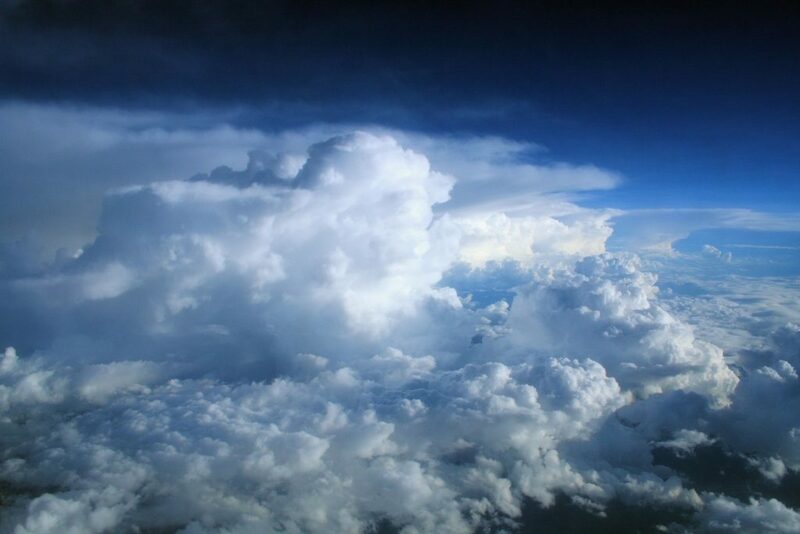 Clouds are shaped in an open way by wind and sun and evaporating water; the water molecules could become randomly distributed; small inputs lead to large and hard-to-predict results. The magnificent and ever-changing shapes of a cloud are the result of the self-organizing emergent property of this complex system of air and water molecules. There is no programmer such as a cloud-creator, there is no force, such as gravity, leading to particular shapes at a particular time. The unfolding of clouds is an emergent property, continually arising. The molecules of water are not completely random, nor are they cued up in a straight line. Ever since I read that, I have had a happy dance going on inside. While it doesn’t change the fact that life is baffling and beautiful, it framed a way for me keep hope alive. Life is just one big, self-emergent system! It’s a whole mix of humanity bumping into each other, moods, divine intervention, and yes, our goals reframing that system as well. It is chaos-capable and non-linear. No one thing leads to a particular event at a particular time. It’s all of it, together. So keep on dreaming, dreamers. Your force needs to be part of this mix as much as anything else. Let the other parts of the system play out as well, for play they will. Also, if you want to know what I did this year for reflecting, I asked these 3 simple questions from Marie Forleo. If you would like, share what you discovered in the comments.